I'll be back very soon, but until then wanted to give you news about a current Blendtec promotion. I know some of you took advantage of the last Blendtec special, so I wanted to pop back to give you news of this Mother's Day special. Blendtec is offering Free Ground Shipping to the continental United States (Excludes Alaska and Hawaii) on all products purchased from their website effective now until Mother's Day (Sunday May 8th). If some of you are wondering what I use mine for, you can search on "Blendtec" to see some of my posts. I use it daily for monster green smoothies (it shows no mercy for frozen fruit and greens! ), making sauces, dips and dressings, especially using nuts and seeds (like my 'Vegveeta Dip', and sauce for "Mac-Oh Geez"), desserts like raw cheesecakes and also ice cream bases. Also, I grind grains like steel-cut oats into a coarse flour (as in my "Instant Steel Cut Oats"). 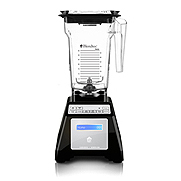 Yep, Blendtec is my most-beloved appliance, use it at least once a day, sometimes 3-4x/day! It's far more than a blender, you'll quickly realize... and once you have one, you wonder how you ever managed without! Allison, I fully realize that. Every time I type something about a wife/husband/mother/father, I wonder "how can I say this without offending, and trying to be pc and not insensitive?" Truth is, it's virtually impossible not to offend someone or exclude someone. I lost my father at an early age, and am not insensitive or oblivious to familial variations. I'm speaking my own experience and voice here on my blog, which is a mom with a hubby, and really just trying to have some fun with a typical relationship situation. Not meaning to hurt anyone's feelings or otherwise upset.